After just 3 years since installation LCD panels of both keypads of my home security system failed pretty much completely. It started with one of them developing a lot of 'bad pixels' until the text became unreadable. The other followed the suit few months later. The process from first bad pixels to unusable level took about a year or so. The obvious solution would be to buy new keypads, but to get them into system you need to scan for new keypad using programming commands on already installed one. Or find a guy who did the initial installation because he has PC software for doing the programming in humane way.So I decided to take a look and see if I can fix the problem somehow. 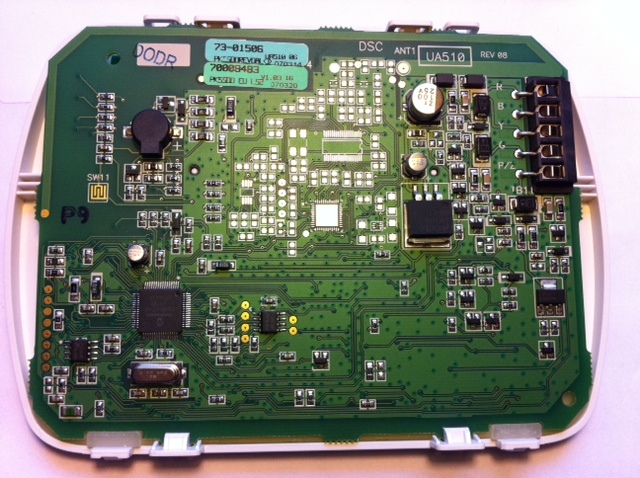 After removing the main PCB, the LCD subassembly is exposed. There are two fatures of it that immediately look suspicious. On the bottom there are two connection pads made of silicone and thin strips of something that works as connector. This is for connecting the LCD to main PCB, the only thing keeping the two connected is physical pressure from main PCB. But there is another suspect too, and this turned out to be the real cause of failure. 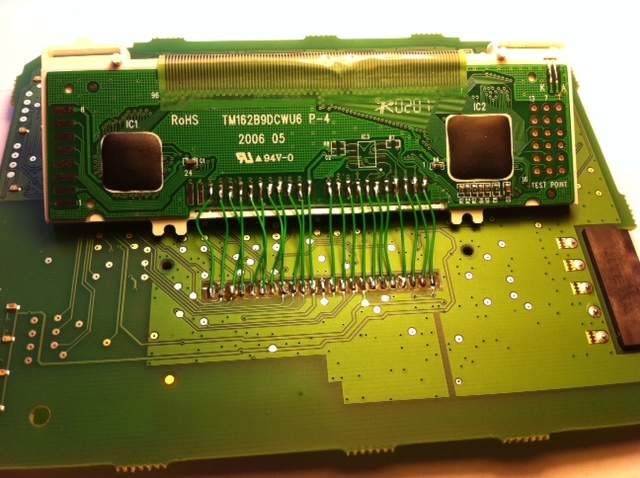 At the top of the LCD there is a ribbon cable with zillion thin connection paths in it, and looks like the only thing keeping it connected with the PCB is some kind of glue. As the ribbon cable is pretty wide and pretty stiff, the glue is probably just slowly giving away as the ribbon cable tries to straighten itself out. 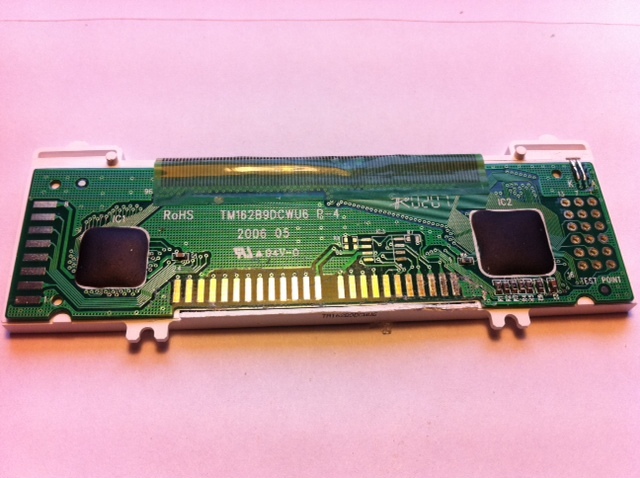 The obvious fix would be to stick something between the LCD and PCB to apply pressure to the ribbon cable connection, so that the connections would again be pressed against the LCD pcb on the backside of it. The problem with this approach is that then the silicon thingies at the bottom of LCD wont make a contact with main PCB (I tried). Next step is a tedious soldering exercise to connect the LCD to main PCB. 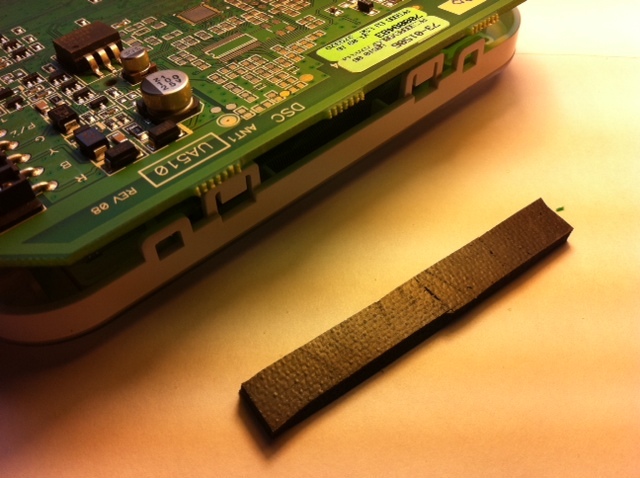 And the final step is finind good material to stick between two PCB-s and putting the thing back together. I happened to have a piece of foamy rubbery material (might be a piece from old mouse pad or some kind of packing material that looked suitable. I cut a strip of that large enough to cover the entire ribbon cable contact area and just placed it between the main PCB and LCD where it is held in place by the pressure alone. The LCD assembly seems to be designed to fail, and this fix wont fully resolve the issue over long period. However, after doing the same mod to both of my keypads, I can report that I now have to keypads that display text that is readable enough to do system programming from them. There is still few scan lines that don't work on both of them, but they are both usable. I just need to keep an eye on them now and buy replacements before they both fade away again, as this time it probably going to be for good.